Tomorrow night marks one of the most intrgiuing/boring/interesting nights of the NBA calender: the NBA Draft Lottery. The simple and sole purpose of the NBA Draft Lottery is to figure out the selection order for the 2013 NBA Draft. Teams get a certain number of balls thrown in a lottery ball mixer and balls are drawn with team logos on them much like in the usual powerball you see on TV. The number of balls that each team has in the pot depends on the number of regular season wins that team had. The team that had the worst record in the NBA will have the best chance to get the top spot in the draft. For 2013, that distinct honor goes to the Orlando Magic who finished with a 20-62 regular season record. The Magic will have a 25% chance at locking in the top spot for the draft. For the Wizards, they have a 3.5% chance at taking the top spot in this years NBA Draft. They finished with a 29-53 record and will have the 8th best shot at winning the top spot. According to the odds, the Wizards are most likely to receive the 8th overall selection and have a 70% chance of doing so. Just because that’s what the odds say does not mean that’s what’s going to happen. You never, some long shot team could jump up and take the top spot for the NBA Draft. If you want to check out the complete list of odds for picks 1-14, check out the Sports Illustrated link below. 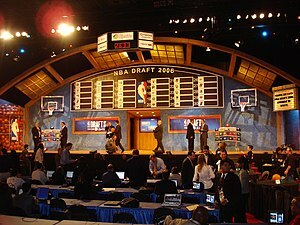 The Lottery is schedule for Wednesday, May 21st and the NBA Draft will be held on Thursday, June 27th.